Partition Master is another software produced by EaseUS that has earned critical acclaim and global popularity due to its functionality and easiness of use. You don’t really need to be tech saavy to make use of this wonderful software. At its core, this is a great software for disk partition management. You can extend your C drive, separate your disk drives and simply manage your disk space more effectively. There are two versions of the software. The free one will offer limited features, but it will get the job done. The paid version offers full-featured partition management with lots of more detailed and helpful tool. In this review we will first talk about compatibility. You can use it on basically all relevant Windows versions, including Windows XP and the latest version of Windows 10. On the other hand, if the file system is in question, this Partition Tool can help you to convert FAT to NTFS file systems. After you install it, the app requires no specific setup. It will give you exactly what you need and that is to part your computer’s drives. Other important feature is that you can safely merge two adjacent partition into a bigger one if needed. Another important thing you should know about this partition manager is that it is a great way to have copy disk drives and recover them, and it can do that from unallocated space. 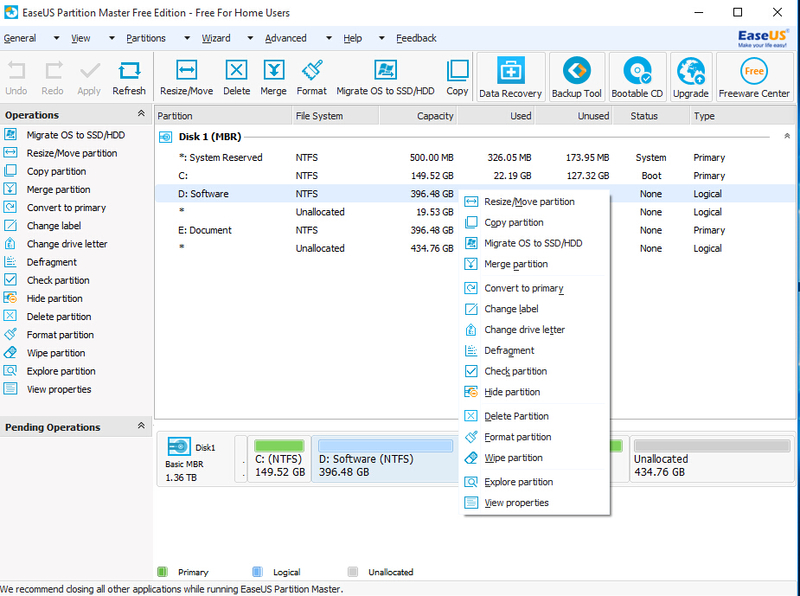 But, besides doing disk partition effectively, this software produced by EaseUS can copy entire hard disk to another without Windows reinstallation. This can really save you time and lots of effort. That also means that you can migrate a Windows operating system to SSD and later use it. One example would be to migrate windows 10 to ssd. However, this is available in the paid version. Let us walk you to the different versions of Partition Master. Note that most of the extra, useful and quality set of features are available on the paid version. The free version however, will be useful to anyone that wants just to merge, resize and manage partitions. The features like migrating operating systems to SSD or HDD, creating bootable disks, business usage and support for Windows Servers is available in the paid versions. Also, for the free version you’ll get 8TB hard disk capacity, while for the paid versions there are 16 TB. Most certainly this is a software that deserves to be paid. The additional features can be extremely helpful and there are constantly offers and discount that can enable you to get the software at a reduced price. The fact that this partition tool was reviewed by cNet and PC World with mostly positive reviews shows and confirms its quality. The set of features and the intuitiveness of the software are also a huge plus. Definitely worth checking out and having it as a tool that can help you manage your disk drives more smartly, save disk space and ultimately speed up your Windows computer.